Tucked away near the eastern border of Rajasthan state and adjacent to the Banganga River is a large & shallow concave wetland – The Keoladeo Ghana National Park, more commonly known as the Bharatpur Bird Sanctuary. Being home to over 350 species of birds, it is this place that is every bird lover’s favourite destination during winters. During early 2000, the endangered Siberian cranes have been recorded from this Sanctuary. Other migratory birds found here include the Brahmini duck, Pintail, Common Teal, Gadwall, Northern Shoveler, Greylag, Bar headed Geese, Widgeon, Common Pochard, White eyed Pochard, Coot and Tufted Duck.The unique Dusky Horned Owl is among the nine species of Owls found here. The Park houses 4 species of Stork that is the Openbill Stork, the Painted Stork, the Black-Necked Stork and the Woolly Necked Stork. Black-necked Storks are resident birds in lowlands. They are large, black-and-white stork with long red legs and huge black bill. During flights (like above shot) one can see a broad black band across coverts and a black tail. Male has black/brown iris whereas the female has bright yellow iris. The pair generally tend to forage together with each of them in sight. This post is particularly about our observation about Black-necked stork feeding behaviour. 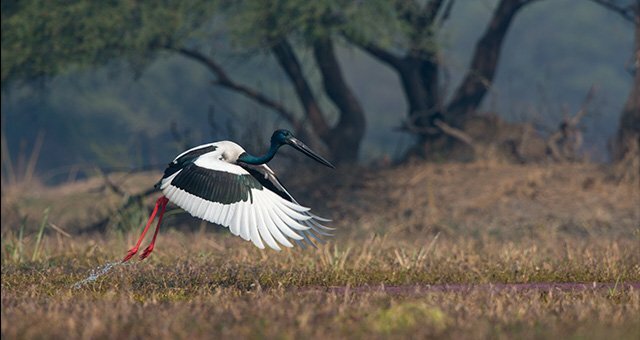 We at Birdwing conducts photography tour to Bharatpur every year. Invariably, every year we have seen this beautiful yet fearsome bird hunting small water birds like coot, ducks and many more at a distance. But, on one cold morning in 2015, our group were sitting quietly near a place when this bird made landing. Immediately it started foraging in the swamp and took off. We couldn’t manage any better shots in those couple of seconds only to land just close by. It immediately picked what looked like a black bag and started swirling rapidly. We immediately shifted our base and positioned ourselves. As I saw through by binoculars, I confirmed to our group that it was a coot that had met its end. What we saw was quite unique! I have always observed the stork just gulping the prey in whole after spinning it few times (I guess it tries to break the neck and eventually kill it). But in this occasion, I saw the male just tearing apart the coot literally into pieces. This was going on for close to six to seven minutes. I wasn’t sure why the male engaged in this brutal method of killing a prey and slicing it. The female was just watching the entire episode. After few minutes, the male left the carcass without eating it. The female approached and took over. But it started eating the pieces. With this so many other small bird’s actually got their meal. Crow, Marsh harrier’s, egrets and Drongo. It was a great observation by our group especially on the feeding behaviour of this beautiful bird. Here is a small video with natural sound as it was recorded.